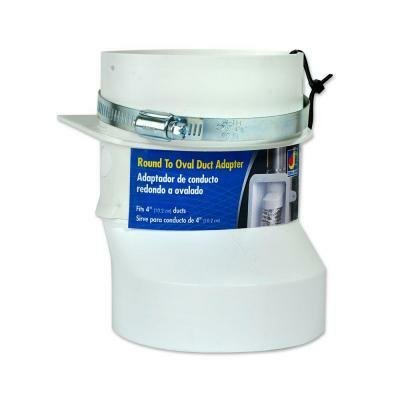 Dundas Jafine's Round To Oval Duct Adapter allows for the consumer to attach the in-wall oval duct to the round dryer transition duct. This product includes an oval shaped 4 in. galvanized steel worm drive clamp, for easy attachment of the in-wall oval duct to the oval portion of the adapter. The adapter can also be easily disconnected for regular cleaning of the dryer duct. All merchandise is warranted to be free from defects in workmanship and material for one year form the date of purchase. This includes normal wear and performance failure on items. Manufacturer will replace or repair at their option. This warranty does not cover any malfunction, performance failure, or defect arising from the misuse, abuse, neglect or modification of the product.